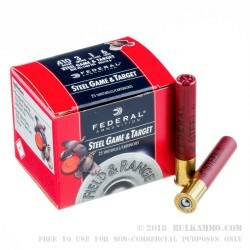 The Federal Steel Game & Target .410 3” 3/8 oz #6 Steel shot is an affordable and reliable offering from this trusted American brand. At 25 rounds per box, this product is just a single box with 25 rounds. You can quickly bulk up to a full case level if you pick up 12 boxes though. 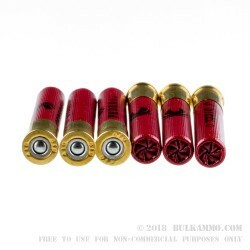 This ammo utilizies a powerful muzzle velocity of 1400 feet per second and this shell will quickly dispatch targets and upland birds like dove, quail, and grouse as required. Reloadable and durable, you can trust this shell to perform and persist. Trusted since 1922, Federal Ammunition has helped the American sportsmen become the premier expert in hunting and target competition. It is with this quality and experience that they bring the .410 non-corrosive boxer primed #6 3-inch shell to us. These shells combine high velocity, penetration, and greater pellet numbers with several design features to give you top performance on every shot. Their patented wad column technology prevents abrasion of shot on the bore surface of your barrel and does well to eliminate erratic shot patterns. Only the highest quality propellant powder and non-corrosive boxer primer are used in Federal ammunition. High performance in cold weather is aided by separate tough plastic cushioning and gas sealing units in this shell.